AUSTRIA (2011). 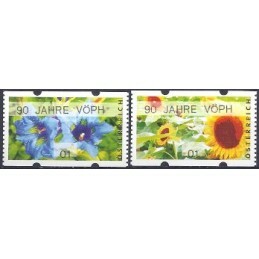 90 JAHRE VÖPH (Flower 3). ATMs mint (01), nr. Sielaff (10.09.2011) - Gentiana and sunflower (Flowers 3). Special imprint 90 JAHRE VÖPH. 2 mint ATMs, small value (2 x 1 c.), both ATMs with number on the back. Sielaff (10.09.2011) - Gentiana and sunflower (Flowers 3). Special imprint 90 JAHRE VÖPH . 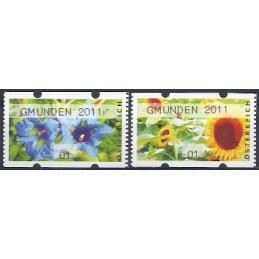 2 mint ATMs, domestic postage (2 x 62 c.). AUSTRIA (2011). 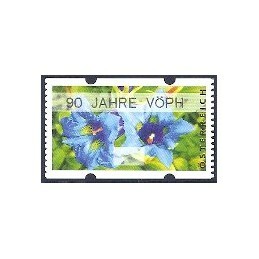 90 JAHRE VÖPH (Flower 3). ATMs mint (62), nr. Sielaff (10.09.2011) - Gentiana and sunflower (Flowers 3). Special imprint 90 JAHRE VÖPH. 2 mint ATMs, domestic postage (2 x 62 c.), both ATMs with number on the reverse. Sielaff (10.09.2011) - Gentiana and sunflower (Flowers 3). Special imprint 90 JAHRE VÖPH. 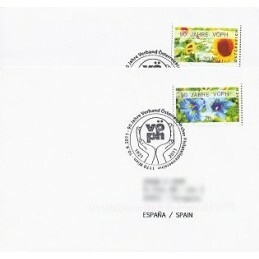 2 first day covers mailed to Spain (2 x 70 c.). 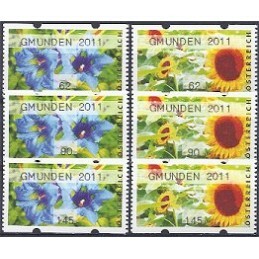 With postal indexations. Sielaff (10.09.2011) - Gentiana and sunflower (Flowers 3). Special imprint 90 JAHRE VÖPH. 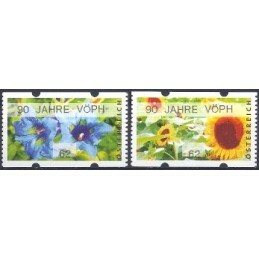 2 first day covers, domestic postage (2 x 62 c.). Sielaff (10.09.2011) - Gentiana and sunflower (Flowers 3). Special imprint 90 JAHRE VÖPH. Mint label with no face value, design gentiana. AUSTRIA (2011). 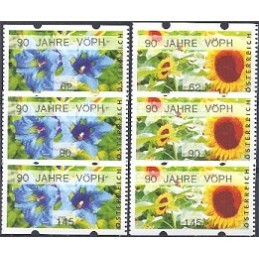 90 JAHRE VÖPH (Flower 3). Sets 3 val. Sielaff (10.09.2011) - Gentiana and sunflower (Flowers 3). Special imprint 90 JAHRE VÖPH. 2 mint sets 3 values, domestic mail (2 x 62-90-145 c.). Sielaff (10.09.2011) - Gentiana and sunflower (Flowers 3). Special imprint 90 JAHRE VÖPH. 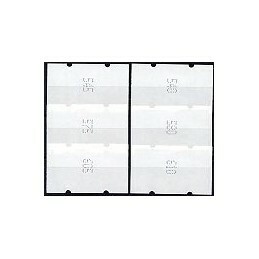 2 mint sets 3 values, domestic mail (2 x 62-90-145 c.), all the ATMs with number on the back. AUSTRIA (2011). 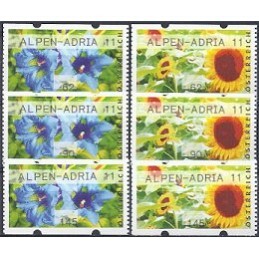 ALPEN-ADRIA 11 (Flower 3). ATMs mint (01), nr. Sielaff (16.11.2011) - Gentiana and sunflower (Flowers 3). Special imprint ALPEN-ADRIA 11. 2 mint ATMs, small value (2 x 1 c.), both ATMs with number on the back. AUSTRIA (2011). 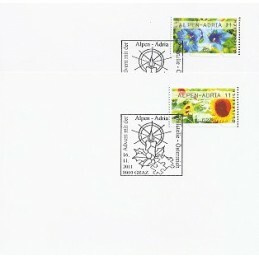 ALPEN-ADRIA 11 (Flower 3). ATMs mint (62), nr. Sielaff (16.11.2011) - Gentiana and sunflower (Flowers 3). Special imprint ALPEN-ADRIA 11. 2 mint ATMs, domestic postage (2 x 62 c.), both ATMs with number on the reverse. Sielaff (16.11.2011) - Gentiana and sunflower (Flowers 3). Special imprint ALPEN-ADRIA 11. 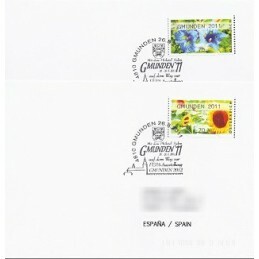 2 first day covers mailed to Spain (2 x 70 c.). With postal indexations. Sielaff (16.11.2011) - Gentiana and sunflower (Flowers 3). Special imprint ALPEN-ADRIA 11. 2 first day covers, domestic postage (2 x 62 c.). AUSTRIA (2011). ALPEN-ADRIA 11 (Flower 3). Sets 3 val. 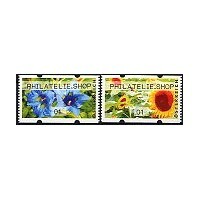 Sielaff (16.11.2011) - Gentiana and sunflower (Flowers 3). Special imprint ALPEN-ADRIA 11. 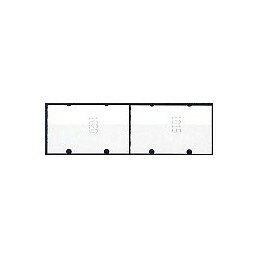 2 mint sets 3 values, domestic mail (2 x 62-90-145 c.). Sielaff (16.11.2011) - Gentiana and sunflower (Flowers 3). Special imprint ALPEN-ADRIA 11. 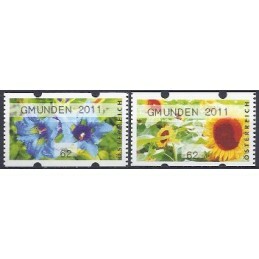 2 mint sets 3 values, domestic mail (2 x 62-90-145 c.), all the ATMs with number on the back. AUSTRIA (2011). GMUNDEN 2011 (Flower 3). ATMs mint (01), nr. Sielaff (26.08.2011) - Gentiana and sunflower (Flowers 3). Special imprint GMUNDEN 2011. 2 mint ATMs, small value (2 x 1 c.), both ATMs with number on the back. Sielaff (26.08.2011) - Gentiana and sunflower (Flowers 3). Special imprint GMUNDEN 2011. 2 mint ATMs, domestic postage (2 x 62 c.). Sielaff (26.08.2011) - Gentiana and sunflower (Flowers 3). Special imprint GMUNDEN 2011. 2 mint ATMs, domestic postage (2 x 62 c.), both ATMs with number on the reverse. Sielaff (26.08.2011) - Gentiana and sunflower (Flowers 3). Special imprint GMUNDEN 2011. 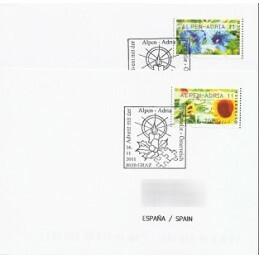 2 first day covers mailed to Spain (2 x 70 c.). With postal indexations. Sielaff (26.08.2011) - Gentiana and sunflower (Flowers 3). Special imprint GMUNDEN 2011. 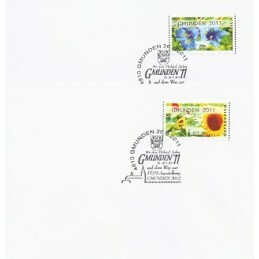 2 first day covers, domestic postage (2 x 62 c.). AUSTRIA (2011). GMUNDEN 2011 (Flower 3). Sets 3 val. Sielaff (26.08.2011) - Gentiana and sunflower (Flowers 3). Special imprint GMUNDEN 2011. 2 mint sets 3 values, domestic mail (2 x 62-90-145 c.). Sielaff (26.08.2011) - Gentiana and sunflower (Flowers 3). Special imprint GMUNDEN 2011. 2 mint sets 3 values, domestic mail (2 x 62-90-145 c.), all the ATMs with number on the back.